Provenance: I bought this from Tower Records in Tokyo last month. I didn't have to listen to a single note of it to know it was going to be a triumph. Just look at the cover and tell me that's not the smoothest man in Japan? Review: This album sounds exactly how you hope and expect it to sound. I didn't know it at the time, but Yoshino Fujimal is emblematic of a genre called 'city pop' that thrived in Japan during the 1980s. Sleek and cool, it trended towards the more sophisticated end of the yacht rock spectrum. From what I can gather, Fujimal was a member of the AB's (essentially Japan's equivalent of Toto), a skilled studio musician with a fine ear and chops to burn. I've struggled to find out more about Fujimal and can't see much solo work beyond the late 80s; perhaps it's indicative of nothing more than my ineptitude with Google, because one sad alternative is that he simply didn't receive the wider recognition his talent deserves. Funk guitars, popping bass and a starlit saxophone all herald the start of 'Who Are You? '; friends, a masterpiece. It's like all the best bits of the Cate Brothers and Christopher Cross if they sang in Japanese. If anyone, next track 'Mid-night Plus 1' is even better; it sounds like Earth, Wind and Fire's 'September', if the latter put on a pastel suit, rolled up the sleeves and came up with a better chorus. It's so good that once I'm done with this review I'm going to skip back and listen to 'Mid-night Plus 1' all over again. The album is divided into 'day' and 'night' sides, not that I can really tell much of a difference (if its manifested in the lyrics, I'm screwed, as my Japanese pretty much extends to 'yes', 'no', 'please', 'thank you', 'beer', 'hospital'). Though the instrumentation and production belies the age of this collection, it's not to be supposed that Yoshino Fujimal is dated. Instead, guitars either cluck or soar as appropriate, saxophones scrape the firmament and synths twinkle with a neon pearlescence. I can't tell whether this version has been remastered but everything sounds absolutely present and fantastic. In terms of technical accomplishment, it's every bit as finely-wrought as ABC's Lexicon of Love or Donald Fagen's The Nightfly (both, incidentally, released in the same year (1982) as Yoshino Fujimal - if only Sade's Diamond Life had not been two years later I think we'd seriously be treating it as the high watermark in popular music recording). The first song fully rendered in English - 'Girl's In Love With Me' - could've been a hit. It should have been a hit. It's a skilfully delivered slice of AOR with a nagging hook in its chorus, sweet and addictive. 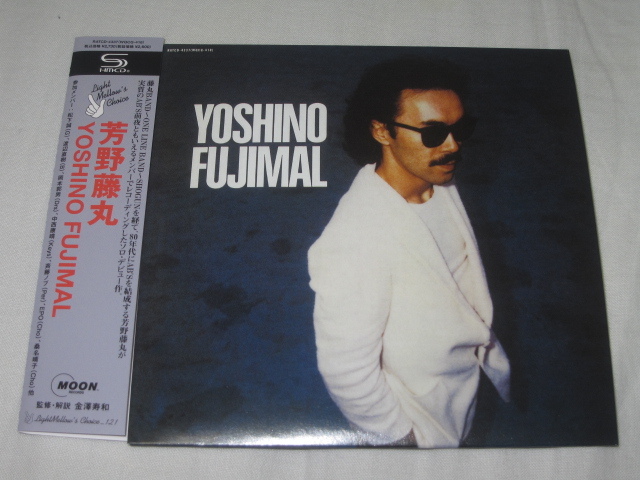 Furthermore, Fujimal is an excellent, soulful singer, seemingly at home with English as he is in Japanese. I can only think that it's the provinciality of the music business that prevented this album or any of its singles from making a mark. Depressing, eh? How many other Fujimals were - are - out there? Still, we got Bros, so who am I to make such a plaint? Japan was an incredible experience and, unusually for a traveller who enjoys novelty as much as I do, I want to return before long. And when I go back, I'll be devoting some serious time, research and money on snuffling out more gems like Yoshino Fujimal. If you're exposure to Japanese music has thus far been J-Pop and Babymetal (says a guy who, two months ago, only had a Flied Egg (yes, really) album to show on that score) you're missing out. But where else do I turn? Brazilian psychedelia? Italian prog? Heavy metal in Iraq? I'm going to become one of those twats that goes to WOMAD every year, aren't I?